Solid or stranded, bare or tinned, copper wire conductor. PVC insulated, nylon outer jacket. 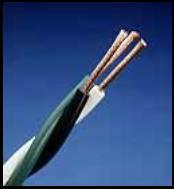 For use as a 600V building wire in fixture raceways, metallic conduit and tubing. Gasoline and oil resistant. Wet or dry locations. All surface printing is under nylon jacket. Optional use as appliance wire, (AWM) 105°C 600V or 90°C 1000V.